I'm sure many of you have already tried the wonderful new app called Waterlogue. If you haven't, you're in for a treat! 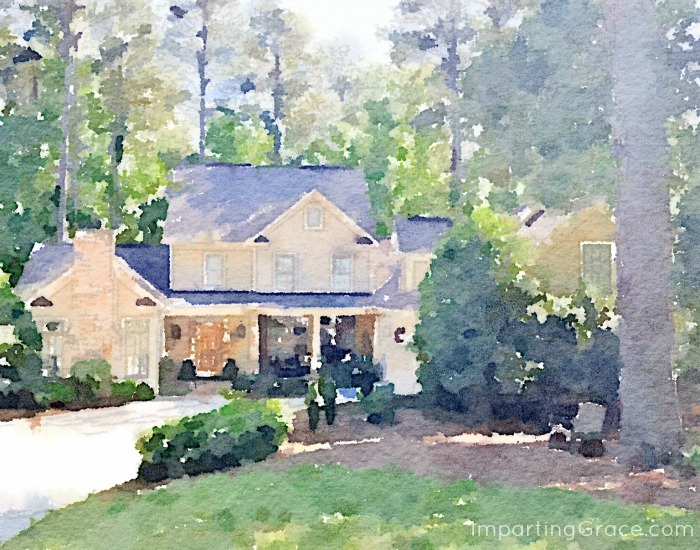 In just a few seconds, Waterlogue can create a beautiful watercolor from a photo. I was so thrilled with the result that I had the "watercolor" printed in a large size and framed it! If you've wondered how a Waterlogue picture would look printed out, here's your answer. Isn't it lovely? I've always wanted just the right piece of art for my foyer, and I think this fills the bill. Here's how to make your own. If you don't already have it, you'll need to buy Waterlogue from the App store. At $2.99, I think it's a great deal! 1. Select a photo. I chose a photo of my house that I had taken last summer. 2. Email the photo to yourself. 4. Open the Waterlogue app and select your photo. 5. Follow the Waterlogue prompts at the bottom of the screen (very easy to use!) to create a painting you like. I used the "natural" option for this project. 6. Scroll further through the options and click on "No Border." This will eliminate the curved edges. 7. Once you have the painting looking like you want it, click on the heart to save it. 9. Take the flash drive to a printer and have the photo printed in whatever size you choose. I had mine printed in a 12"x16" size so that it would fit in a ready-made 16"x20" frame. My local FedEx Kinko's office was able to print it while I waited for $2.00. 10. Frame as desired. I had a custom mat and fillet cut for mine. 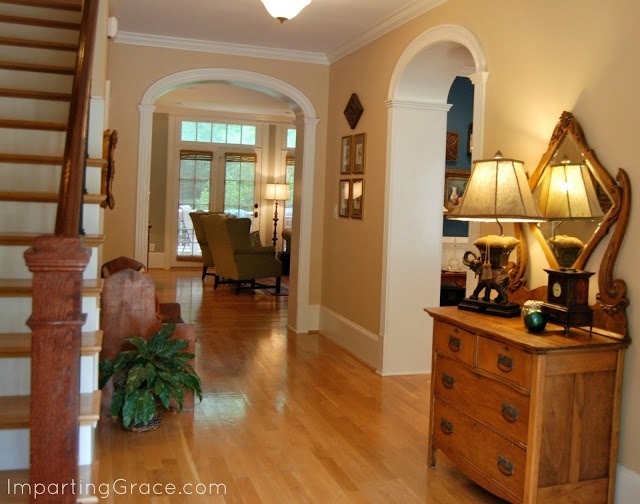 My foyer isn't grand or glorious, but I like for it to look nice. Here's a photo of it taken from the front door. 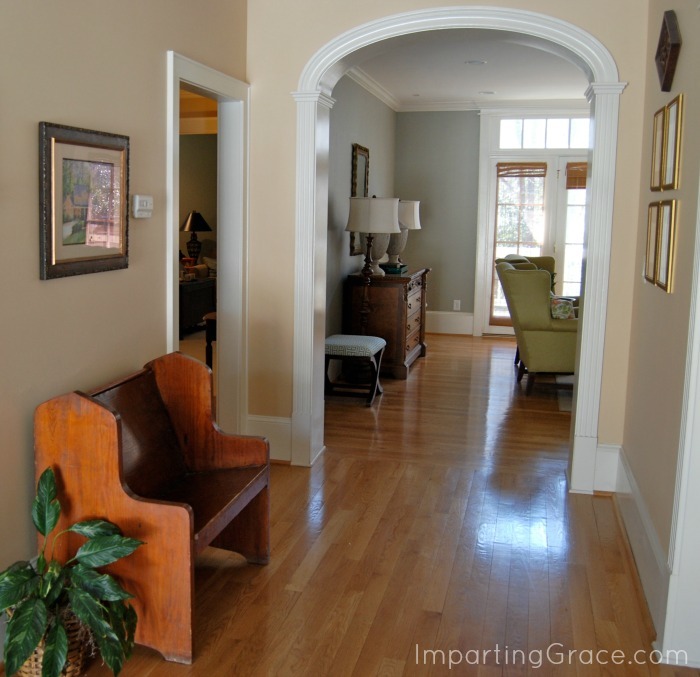 As you can see, it leads to both the living room and the dining room. And now I have the perfect piece of art to hang over the antique deacon's bench! Please forgive the glare--the sun was out in full force when I took this photo. 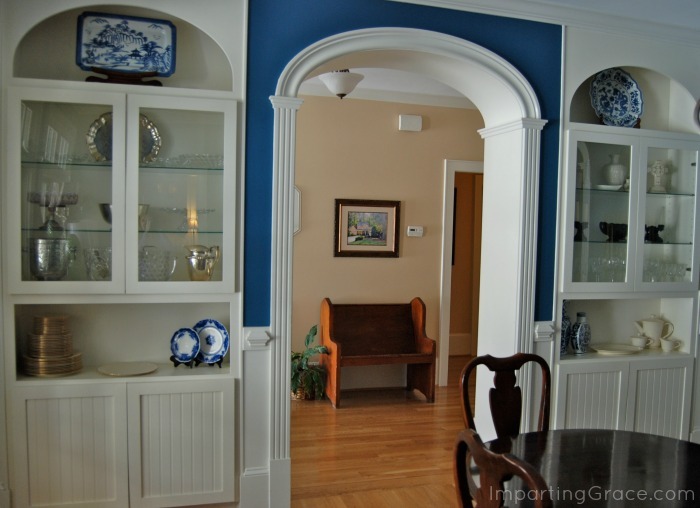 Here's a glimpse of the artwork taken from the dining room--no glare from this angle! The wheels in my mind are really spinning now--I can't wait to create some more lovely watercolor paintings! Have you tried Waterlogue? Have you printed anything from it? Please share! Very cool, Richella, and you home is so pretty. WOW, that is wonderful! Such a great addition to your beautiful home. Thanks so much for this detailed tutorial! My mom and I were just talking about doing this for her home. :) I sent her the post link! What a great project! I have to get this app for my phone! 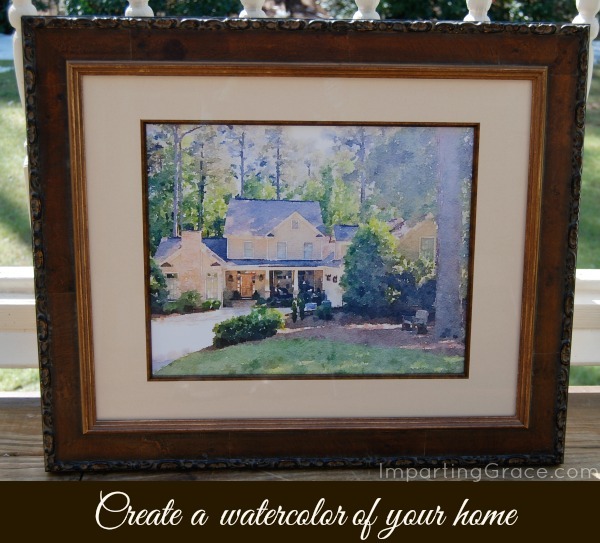 Your house print looks professionally done and makes a great addition to your foyer. That is fabulous! Thanks for sharing that app - I have never heard of it and it is great to know someone who has actually used it and had great success. It looks wonderful! I love the WaterlogueAPP. I didn't know though that you could send a picture from your computer to your phone. Now I'm so excited! I want to capture some of the pictures I've taken of my home over the years and frame them. We won't always be living in our lake home and it will be fun to have a reminder wherever we go in the future. I'm pinning to my Pinterest technical board so I remember your great step-by-step instructions. Your picture is exactly what I'm planning to do! This app is fabulous! Warning... It is habit forming. Most of my friends and family knew about it, but I did fool a couple of friends to thinking I had painted them! I just recently started playing with Waterlogue. It is addicting! Glad to know it is easy to have these printed on watercolor paper. Thanks for the tips. Rhondi @ Rose Colored Glasses is hosting a Waterlogue Wednesday party. You should link this post. 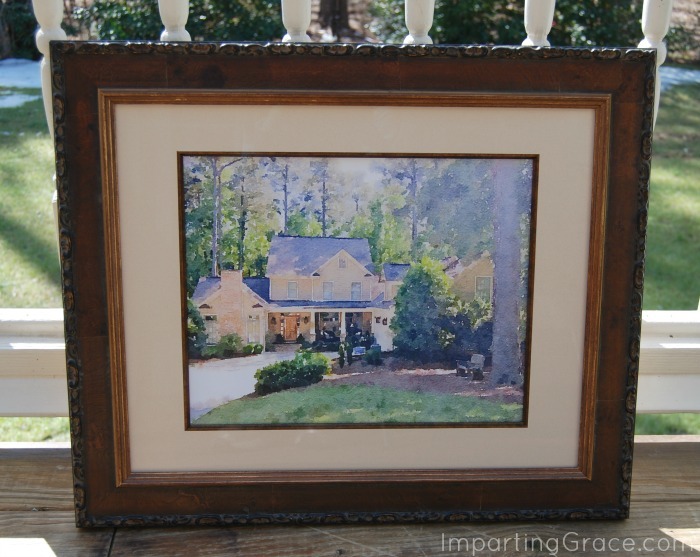 What a beautiful watercolor print of your home! Thanks for sharing your success. I think I will try it. 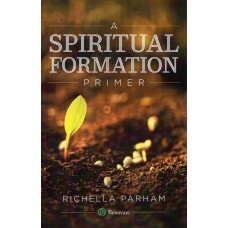 Wow, this is just beautiful, Richella! I keep hearing lots of good things about Waterlogue but haven't tried it yet. Now I am very tempted. This is great and I would love to do this at the new house. Thanks for the information!!! I love this SO much, Richella! 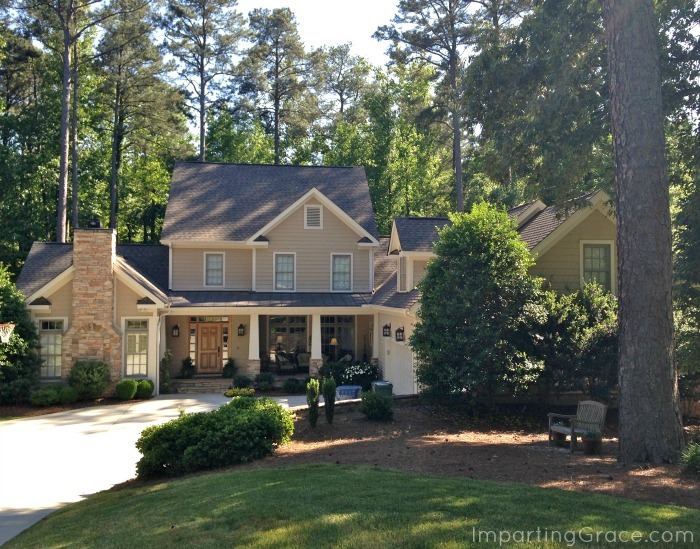 Your trees around the house make it a perfect setting. This would be a great gift for my parents...hmmmmm. Absolutely gorgeous! It doesn't hurt that your home is so beautiful. :) Pinned! That really lovely! No haven't tried it but it's something I'll put on my list of things to do before we sell this house. I love this app, I also did some photos of my house in different seasons. I printed mine on my printer at home using watercolor paper and they came out great, I am still working on how I'm going to frame and display them. Richella that looks beautiful!! your entry is so bright and pretty! I did one of my house too and my studio. I used my house one as part of my header on my Blog. I am having as much fun with this App as everyone else. Some even offered to buy some of my photos turned watercolors thinking I had painted them.